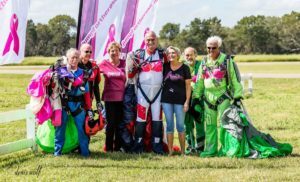 Jump for the Rose at Skydive San Marcos! On Saturday, June 7th, we are happy to Join SSM and Rd Latimer as they organize FORMATION loads!! On Saturday night we are going to boogie on down to tunes from the 70s and 80s to celebrate SSMs 30th Birthday!! Come join Jump For The Rose and buy a t shirt or make a donation to help save women’s lives!